From a distance, the moon appears to be a bright white ball of rock, with grey bits. Pictures sent back from the manned lunar landings suggest that when you're up close and personal with it, it's still a bright white ball of rock, with grey bits. It also appears to be covered in rocks and craters. But, that's about it. There's nothing else there. Of course, we now know that the lunar landings were faked. Yep, there's no way that flag can be waving on the moon's surface, and where are the stars in the photographs? And there's more technology in a Nokia 3210 than there was in the Apollo spacecraft. The only obvious explanation is that it was all made up. And, now we're in the 21st Century, and we're all wise to these government conspiracies and suchlike, we can disprove things that we once took as being fact. Where is this all leading? I have no idea. Somehow, it was going to link into a lookback at the video game Moon Patrol. I was going to say something about the moon landings being genuine, but the photographs being fake, and that's why conspiracy theorists have wet dreams about finding flaws in them. Yep, the photographs were fake, because rather than the moon being the dull, white-grey, rocky and cratered world that the photographs suggest it is, it's actually a multi-coloured world populated by hostile aliens, landmines and all kinds of problems. NASA didn't want us to know this, as it would cause all kinds of chaos here on Earth, so they faked the photographs and videos that we saw. Irem, somehow, got hold of the real footage, and ten years after Man's last trip to the Moon, they created a game based on the exploits of the Apollo astronauts, a game based on the truth. 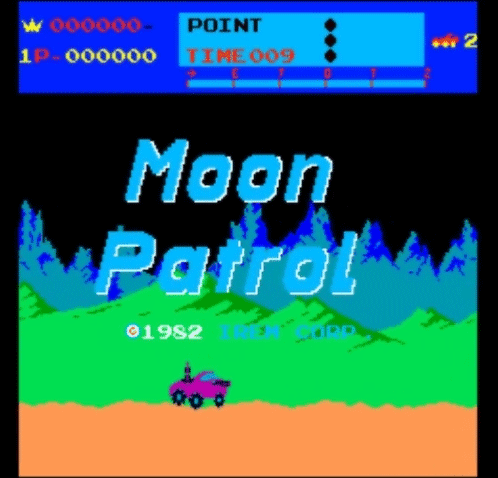 Moon Patrol was it's name, and patrolling the Moon was the game. Spaceships and craters, oh my! 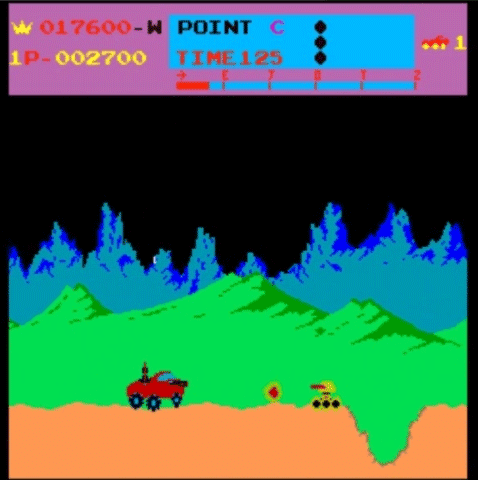 In Moon Patrol, you control a moon buggy, an exact digital replica of the lunar rover that hitched a ride on Apollo 15, 16 and 17. This buggy bobbles around the uneven surface of the moon, and is able to jump over craters or small rocks. To obliterate large rocks, you can shoot them. This gun also shoots upwards, destroying any menacing enemies hoping to crap a missile onto your head. Levels are split into areas, marked by ascending letters of the alphabet from A to zee. Each time you die, you are taken back to the start of the last letter you reached. Every now and again, you can have a break when you reach certain areas ("E", "J", "O", "T" and "Z"). If you have got to them in record time, you get a bonus. If not, you get nothing. Moon buggy has transformed into a rainbow splodge. His wheels are flying out of control. Oh no! 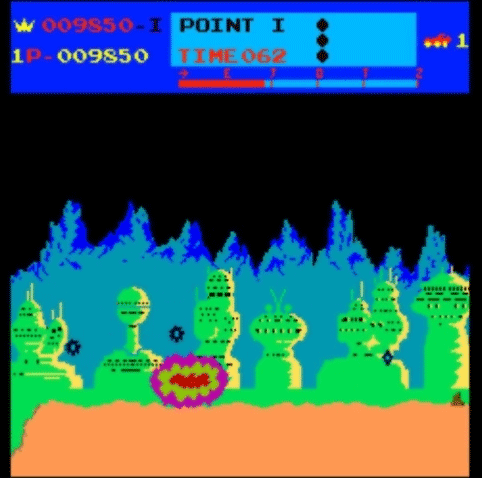 Moon Patrol was one of the first games to feature funky parallax scrolling. Back then, it must have sent the kids wild. Hynotised them even. It does give the moon a sense of depth, something severely lacking in those faked photographs taken in the Blue Peter studio. It also has a constant background tune playing throughout the game. Fortunately, the tune isn't at all annoying and complements the game very well. Accompanying sound effects are also implemented into the game well, not too loud or too annoying, fitting in with game's action. Going back to graphics, as a special mention must go to the moon buggy's wheels. The way they bounce up and down the contours of the Moon's surface, and fly out in all directions when the buggy explodes is all quite amazing. Even now in 2012. Yep, there's more realistic damage effects on that 1982 moon buggy than there is in Gran Turismo 5. It's not just in looks and sounds that Moon Patrol shines. The gameplay is also great. You have to concentrate both on what's ahead and what's above you, and the actions of what's above you can effect what will shortly lie ahead of you. If certain enemies shoot a bullet at the surface, they will leave a crater. So, you have to be prepared to shoot down the enemy, and ready yourself for a jump over a crater. Oh yes, your attention will be pulled from one direction to another within seconds. It reminds me of being at home with the wife. What do you mean, you want me to put the bin out? You've just told me to clean the car? And paint the spare room? Yes, there's lots going on at the same time, and things can get quite chaotic. Game Over comes frequently. However, it doesn't ever really feel unfair. Something I harp on about a lot is how fair a game is. Some games can be extremely difficult. Sometimes this is down to them having dodgy controls, or unfair deaths as a result of unseen traps or leaps of faith. Other times, they are just because they require skill. In these games, deaths only happen as a result of a player's mistake, not due to the game's bad design. And Moon Patrol is one of those fair games. It's challenging in parts, but it's fair. And that's important. So, yes, Moon Patrol is a great game. It's fun, addictive, challenging, and for its time, technically impressive. It was converted to several machines, although I've never actually played any version other than the arcade, so there's potential for a Conversions Comparison at some point. This game, along with Phoenix and Pac-Land, was one of the very first arcade games I played, so it has a special place in my heart, and I'm pleased that my decision to revisit the game hasn't changed my opinion of it at all. The bright colours of the Moon draw your attention, and everything just feels nicely done overall. Colourful levels, good-looking sprites, a great use of parallax scrolling and some nice animation effects. A tune plays throughout which is pretty decent, and there are plenty of sound effects audible in the vacuum of space. Instantly accessible, with simple controls that handle well and a level of challenge that builds up gradually. 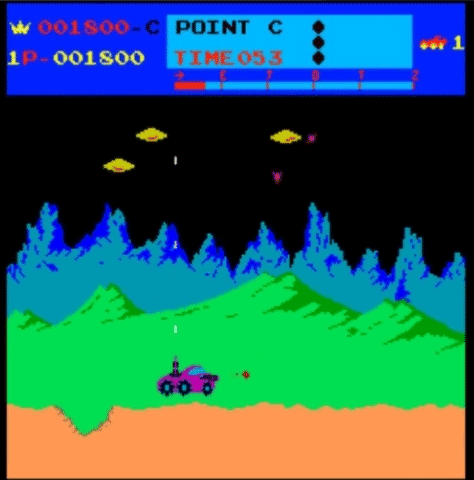 Moon Patrol is a fun little game, and shows how quickly video games had moved on in the four years from the debut of Space Invaders. Importantly, it is still a great game to play today. You can explore the moon to your heart's content from the comfort of your home or while out and about on Nintendo's Switch gizmo. Moon Patrol is also available in Japan on the PS4.